Da Nang (Đà Nẵng) is known as the city of beautiful and unique bridges. These bridges not only play an important role in economic development but also nowadays are the must-visit attractions together with other destinations of Da Nang that attract millions of travelers and tourists. 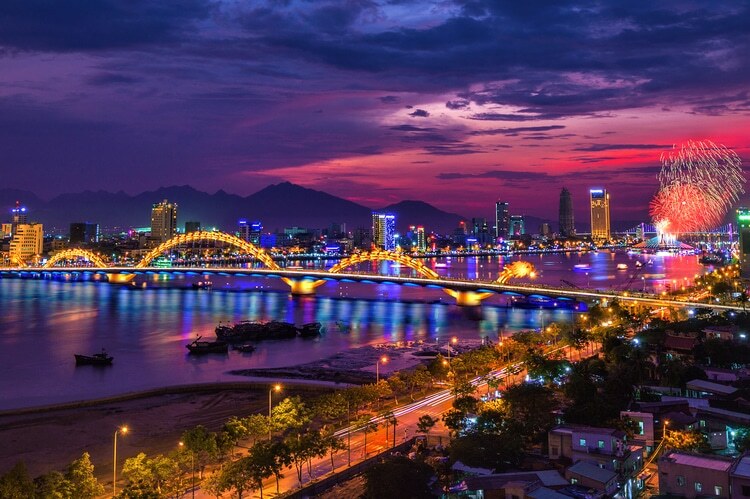 The best time to visit Da Nang bridges are in the evening when the Da Nang bridge shows their impressive beauty, and you can have the opportunity to enjoy the panoramic view of Da Nang city. Here are the top 5 attractive Danang bridges at night that you definitely visit when coming to Da Nang, Vietnam. One of the oldest Da Nang bridges in Vietnam is the Han River Bridge which nowadays becomes a symbol of Da Nang, attracting a lot of tourists and visitors to come. This bridge with 12.9 meters width and 487.7 meters long connects the two main roads of the Da Nang, Pham Van Dong Street, and Le Duan Street. It consists of 11 spans (each span: 33 meters) and 2 spans of stay cables. Visiting this bridge at night, you will have an opportunity to admire its beauty that is highlighted with hundreds of colorful lights. If you want to see the moment of Han River Bridge opening for fishing boats to pass through, you should visit after 12 am. During this time, the bridge will rotate 90 degrees around the axis, lying along the flow of the Han River. After 4 hours, the bridge can return to its old position. 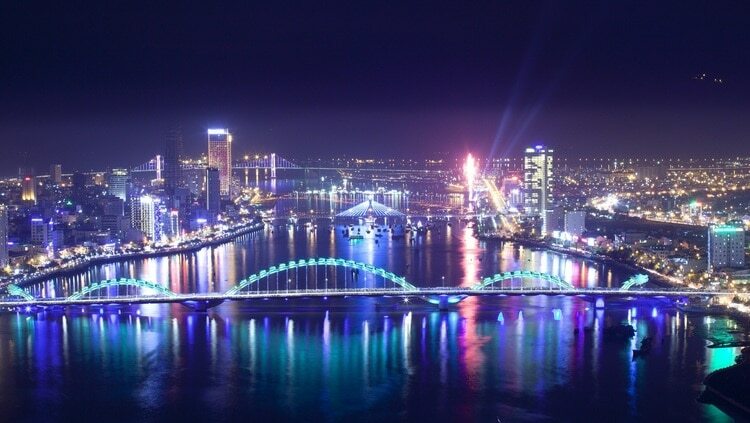 Opened in 2013, the Dragon Bridge with its beauty at night is a new symbol of Da Nang. Situated in the heart of the city, this bridge has quickly attracted more and more visitors and residents to come. Because its appearance looks like a real dragon, people call this bridge Dragon Bridge. Dragon Bridge with 37.5 meters width and 666m long crosses the Han River at the Le Dinh Duong/ Bach Dang circle, creating the shortest road from Da Nang International Airport to Da Nang City Center. From Dragon Bridge, there is a direct road to reach Non Nuoc (Non Nước) Beach and My Khe Beach. This bridge was made in the shape of a dragon which can flush and spray the water. To capture this moment, you should visit this bridge at 9 pm on Saturdays and Sundays. If you want to visit attractive Danang bridges at night, you should not miss Thuan Phuoc Bridge, the longest cable-stayed suspension Da Nang bridge in Vietnam. It crosses over the Han River leading to Da Nang Bay. It connects Nguyen Tat Thanh Street with Man Quang Bridge. A night, seen from all angles, Thuan Phuoc Bridge still has an attractive and modern beauty. It draws the large number of visitors not only because of the beauty of luxury but also the prominence and sophistication. Visiting this bridge as a nightlife activity, you can have a great chance to see the sparkling lights brightening the bridge and the vast river. As an impressive landmark of Da Nang, Tran Thi Ly Bridge with its concrete cable-stayed structure wins the heart of every tourist and traveler. During the French period, this bridge was named Trinh Minh The Bridge, and after 1975, it was renamed Tran Thi Ly Bridge. This bridge is designed with the special position and unique shape that also create the unique beauty of this Da Nang bridge. Nothing is better than seeing the elegant color of deck and pylon changing at night, giving a beautiful, eye-catching photography of the city every evening. Therefore, it is a reason why this bridge is a wonderful place for residents and tourists to take pictures especially when the sun sets. Love Lock Bridge is a new Da Nang bridge, but it soon becomes one of the must-visit attractions of Da Nang in the evening. 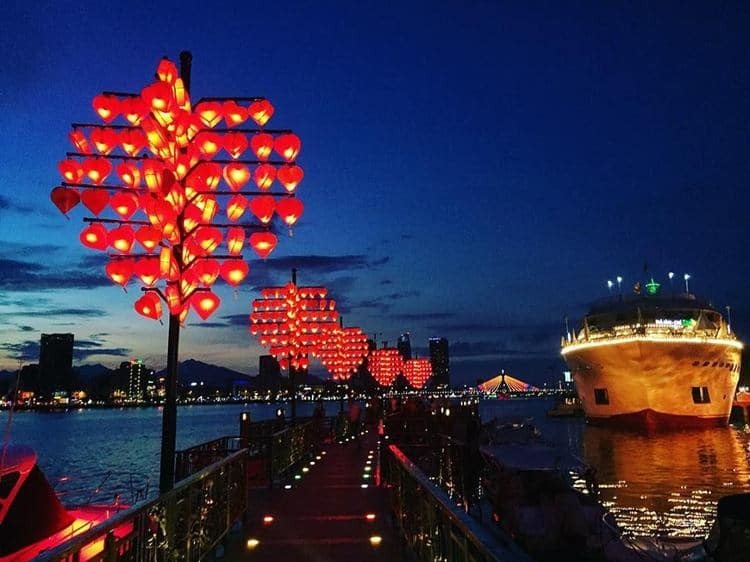 Designed with the Korean style, featuring arc shape with a width of 6 meters and length of 68 meters, the Love Lock Bridge with its romantic beauty is also the ideal place for couples to take a walk and see the beauty of Da Nang. Coming to this bridge, you also have the great opportunity to visit the wharf and lock the padlocks of love on the romantic bridge. These padlocks are carved with the names and messages of love. These famous Danang bridges at night look more beautiful and attractive. It will be regretful if you travel to Da Nang city without visiting these places. I hope that you will get useful information in this article on Vina.com and have a great Da Nang bridge tour.